We have four exciting contests to draw the winners for today. I am especially looking forward to awarding the LeapFrog Tag prize bundle and classroom kit to one reader and their choice of one kindergarten class! Out of 1662 entries, the winner of the $50 Chili's Gift Card contest is . . .
Out of 545 entries, the winner of the LeapFrog Tag. Give. Read contest is . . .
Out of 317 entries, the winner of the Spin & Go Mop contest is . . .
Out of 298 entries, the winner of the Bed Bugs game contest is . 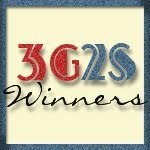 . .
Congratulations to our 4 winners! I will be sending out official email notifications shortly. Please respond within 48 hours to claim your prizes. I am attending a 2-day blog event, so it may take me longer than usual to confirm that I have received your information. Thank you in advance for your patience.